- 10 % discount for all bookings made and paid before 30 Nov 2018! * The offer is not valid during 01 Dec 2018 - 10 Jan 2019! 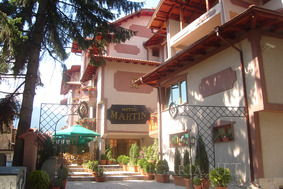 Location: Club Hotel Martin is situated in close vicinity to the centre of Bansko. The hotel is located on a quiet street, not far from Bansko’s old town. Accommodation: Martin club hotel offers 27 rooms and 11 suites, set in two separate buildings sharing a patio. All rooms are elegantly furnished and offer a wardrobe, mini-bar, working desk, cable TV, direct-line phone, free Internet access(Wi-Fi), bathroom with shower-cabin, spa towels. Most of them have balconies with a coffee table, chairs, laundry-rack/line and overlook the magnificent Pirin, Rila, Rodopi mountains. Wine & dine: Martin club hotel offers a 50-seat restaurant serving Bulgarian and international cuisine, local specialties like kapama, choumlek, barbecue, banitsa with rice, etc..
Sports and relax: Guests can relax in the sauna and the hot tub, play table tennis or work out in the fitness room. Massage treatments are also offered. There is also a ski storage room. A small outdoor seasonal pool is also available. Guests can use an underground parking lot.